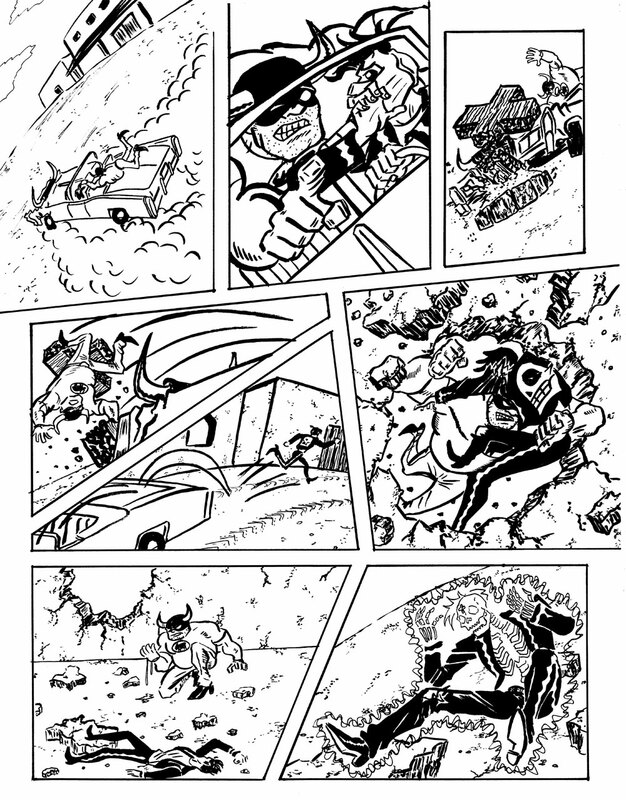 Quick update: My new comic book, WEAPON TEX-MEX Vs. EL MUERTO:THE BATTLE OF SANTA MUERTE!! has been sent to the printers! 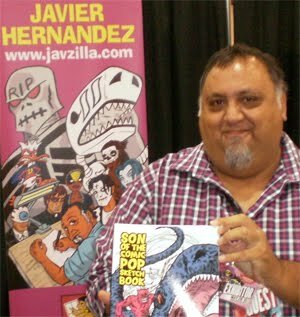 Everything is on schedule for the initial batch of books to arrive in time to debut at the first-ever LATINO COMICS EXPO at the Cartoon Art Museum in San Francisco on May 7 & 8! And here's one of the thumbnails to a page. 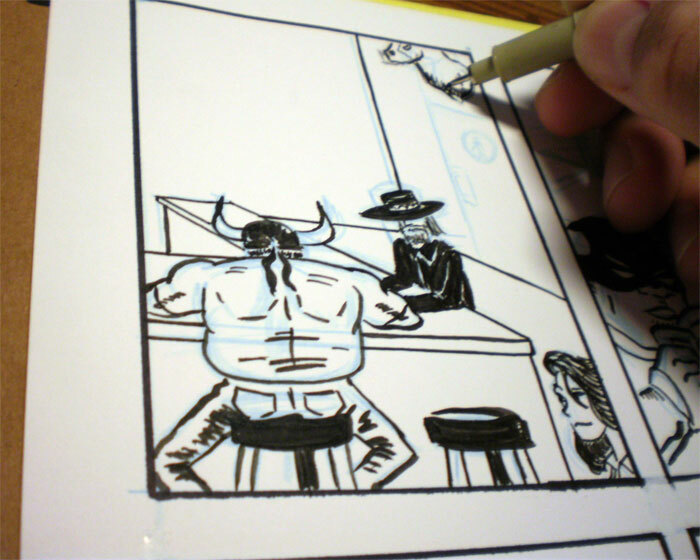 'Thumbnails' is just another word for rough draft, or loose pencils, of an actual comic page. In my case, it's a sheet of cheap, white 8.5" x 11" paper. 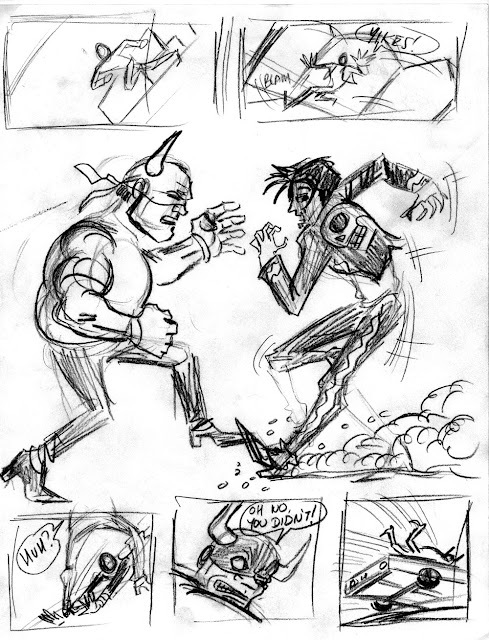 It's done to layout a page, planning what the final, finished page will look like. Here's where I figure out my pacing for the story, how the individual scenes are visualized for best dramatic effect, tempo, mood, staging, etc. If you compare the two, you'll see slight differences. But really the actual sequence of events in the panels is about the same. That's what I mean by establishing my pacing in the thumbnails. When I sketch out the individual panels, I try to pick the best shot for that panel, but when I redraw the page on the larger sheet of paper, that's when I really decide on the best composition for that panel, and making sure I'm satisfied I staged the characters as best I can. cues in my artwork. If the scene, or even the characters, without any dialogue, can convey an emotional state to the viewers, then I feel the artwork has done it's job. But the visual impact is what I want to get across first, as that will be what the readers first process. This applies to quite, introspective scenes as well as chaotic action scenes. One of my favorite words to positively describe what I like about a comic book story, as a reader of comics, is visceral. If I can produce such a feeling with my art, then I've accomplished one of the things I hoped to. For me, working on these pages allows me to totally disappear into the world on the page. 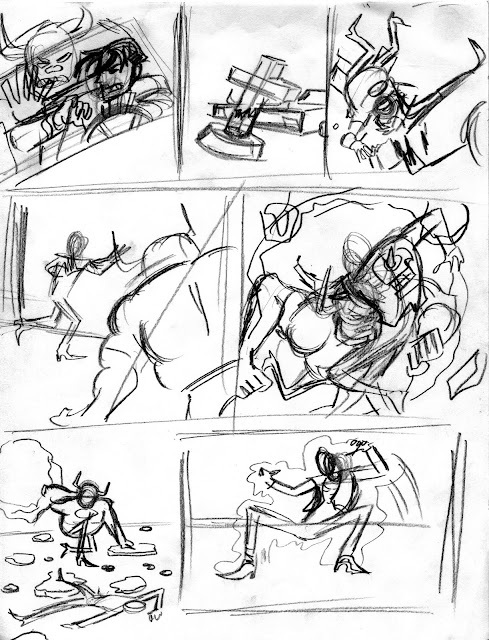 In the thumbnail stage, I'm really focusing on crafting the actual story, pacing out the events panel by panel, page by page. Choosing the best shot, staging the characters, picking reaction shots from one character to the next. So much to figure out, even the size and shape of the panels. Everything on the comic page has to be given some consideration in how it's serving the telling of the story. there's a certain amount of peacefulness I get just working on this stage of the book. And temporarily shutting out the real world, that's where that peaceful sense comes from. One of my most powerful tools I use when inking pages is..... music. When working, I'll pick a playlist of music, usually film scores, that help me envision the world I'm creating. 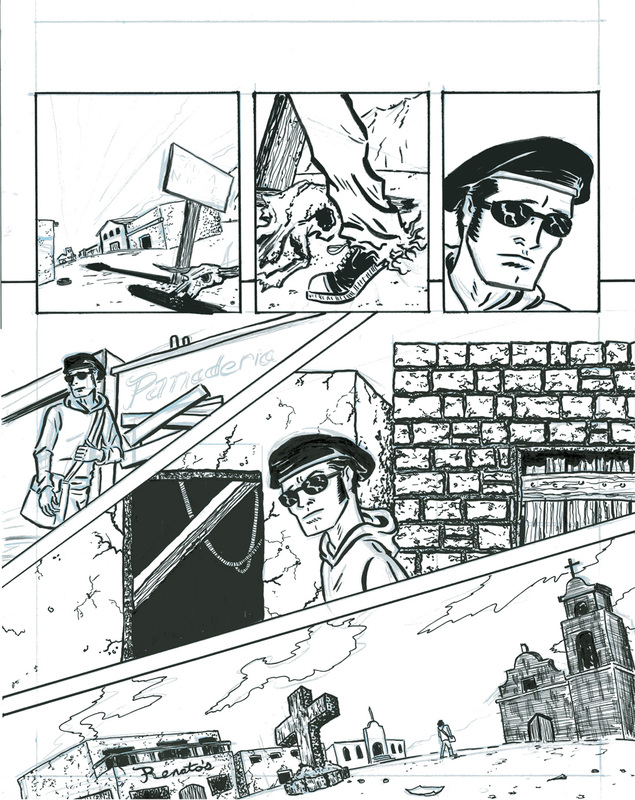 Soundtracks like BATMAN RETURNS by Danny Elfman and THE GOOD, THE BAD AND THE UGLY by Ennio Morricone were very helpful to me in staying in a particular mindset as I worked on my pages. 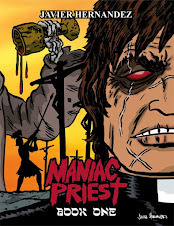 Actually, those films have elements in them that I recalled when making my comic: the macabre mood and gothic nature of one film, and the Southwest grittiness and colorful characters (and their relationships to one another) of the other. It's an interesting well to draw from, but influences come from all sources. 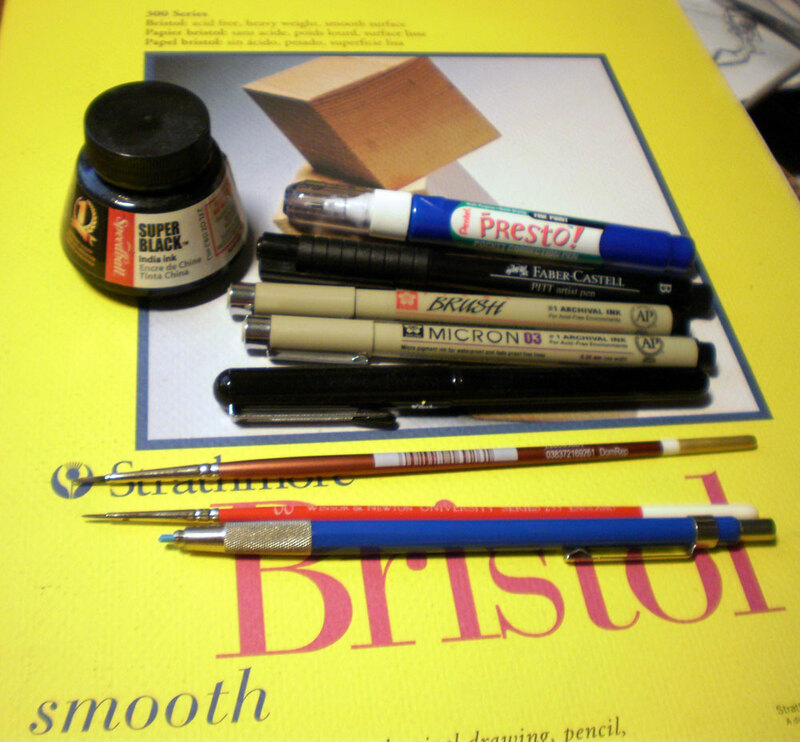 As far as physical tools go, the photo below shows you what I use to ink the pages. On of my favorite new tools is the lead holder (the blue instrument). 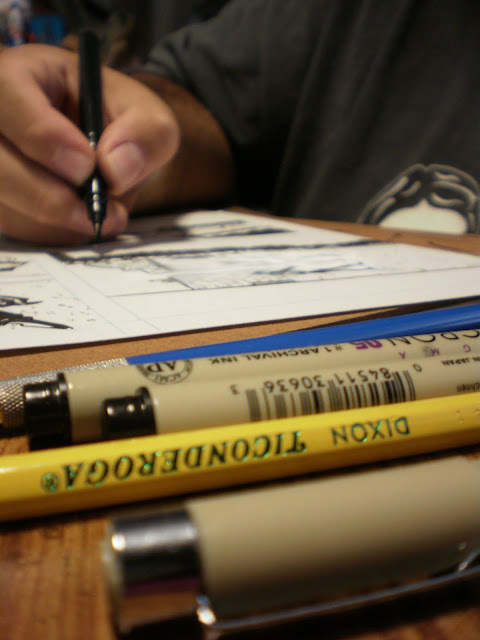 I've usually used Prismacolor non-photo blue pencils for the penciling stage, right before inking. But a friend of mine gave me the lead holder last year, and I like using it with a non-photo blue lead to do my penciling. Can't really explain why I like it better, but perhaps it's because I use less pressure (so the lead doesn't snap), which seems to allow me to get a little looser with my linework. Another favorite new tool is the Pentel Brush Pen, made in Japan, no less. I'm still getting the hang of it, but it does produce some nice long, delicate brush strokes. And I like not having to clean it, unlike a brush. Okay, next time, I'll be sharing with you my process for coloring the story, in gray tones. Thanks for reading, and feel free to leave comments. Always curious what people are thinking about in response to what I wrote. Although albino Yak hair brushes are awesome to work with, that Pentel brush pen is MY favorite inking tool. I use it for EVERYTHING, including finishing field sketches. But you didn't mention your ink and pit pens. Whoops!! You're correct, Luis, I wrapped up my ending too quick!! So, if anyone is reading this comment, I also used some very fine point Micron pens for really small details, like hairs or pebbles or anything else that required a very precise line. 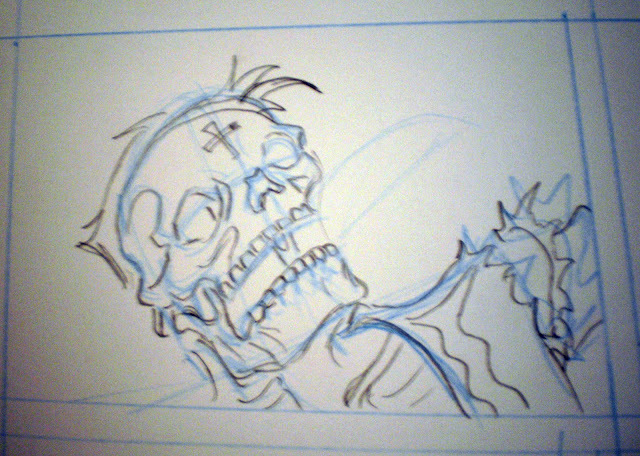 And I also used a Faber-Castell PITT brush pen for few ares, but nothing that required a really fine, delicate point. If anything, I used it to just switch to another tool, but mostly to save wear on my actual brushes. The final inked pages look great! Very "visceral"! And "Il Trio" is definitely top 5 of my favorite Morricone tracks. Just out of curiosity, will this plotline take place before the events of "DAZE OF THE DEAD (pts. 1/2)" or after? This story takes place after DEAD AND CONFUSED. 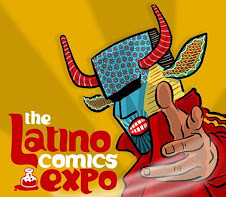 And in fact, as soon as I get back from LATINO COMICS EXPO, I will begin working on Pt. 2 of DEAD & CONFUSED! 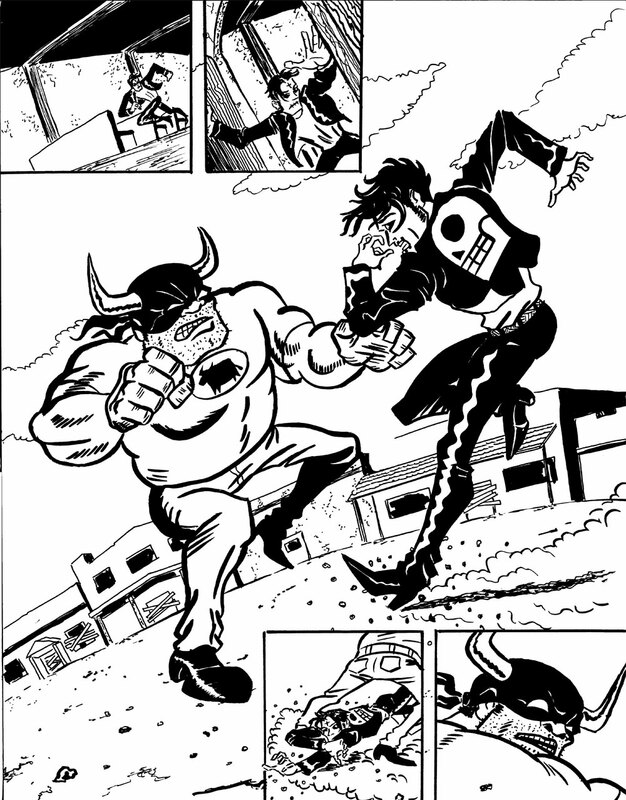 But for Muerto fans, this TEX MEX Vs story is what they call 'canon' (hate that word though!). It's not a dream or imaginary story, it really happened. 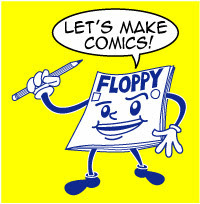 Which is funny to say, cause aren't all comic stories imaginary? But, ya know what I mean! My bad- I meant "DEAD AND CONFUSED (pts 1/2)". I still don't see what you have against the word "canon" Javier. Not only is it fun to say, but it makes you sound smart. Especially if you wear a lab-coat with sparkly suspenders whilst illustrating your point on a chalkboard...lol. Would you prefer "continuity"? I always considered the more wacky adventures of El Muerto to be elseworld tales with the darker more gothic stuff being the "real" story. I guess it's everytime I read the word 'canon' it's for some 70 yr old comic franchise and it just sounds silly when they pick and choose what's 'canon'. Usually it has to be a run from a very popular writer. It's like "Your stuff counts, but the last 3 years don't"
I really shouldn't worry about that though! But yeah, TEX MEX Vs MUERTO 'really' happens! !